Fiat Chrysler's New CEO Faces Twin Challenges: China And Tariffs Sergio Marchionne, the man who saved Fiat Chrysler, has died. His successor now leads a company facing big challenges. It has yet to crack the key Chinese market and tariffs may hurt profits. 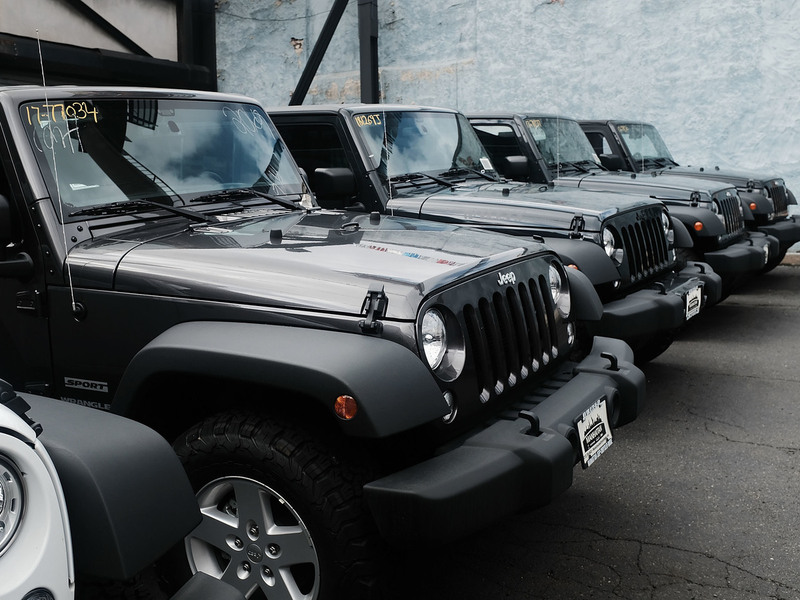 Jeep Wranglers are displayed at a Manhattan Fiat Chrysler dealership. The automaker's latest quarterly earnings announcement comes at a time of deep uncertainty for the company. Sergio Marchionne, the charismatic CEO who led the acquisition of Chrysler and saved it from ruin nine years ago, has died, it was announced Wednesday. The 66-year-old executive had been hospitalized following a sudden health crisis, and the future of the company is once again up in the air. Word of Marchionne's death came the same day his company reported weaker earnings. Fiat Chrysler said its net profit for the second quarter was 754 million euros, or about $882 million, a 35 percent drop from the same period a year ago. The man chosen to replace Marchionne at the head of Fiat Chrysler struck a somber tone on a morning call with investors. "There is no doubt that Sergio was a very special, unique man," said Michael Manley, the automaker's new CEO. "And there is no doubt that he's going to be sorely missed." In June 2009, six months after the U.S. government stepped in to rescue Chrysler and just after the company officially emerged from bankruptcy, the Italian-born, Canadian-raised Marchionne stepped up to a podium in Auburn Hills, Mich., to address Chrysler employees. "It is my great privilege to greet you as your new chief executive officer," he said, standing in a black, short-sleeved polo shirt emblazoned with the logos of Chrysler, Jeep and Dodge. "Although we have many challenges yet to overcome, there's not a single doubt in my mind that we will get the job done." There were plenty of doubters then. But Marchionne's words quickly turned to results. The company updated its vehicle lineup and returned to profitability. Fiat Chrysler repaid the billions of dollars in U.S. government loans six years ahead of schedule and with interest. Nearly everyone credited Marchionne. "He had shown that he can achieve what seems to be the unachievable," says Rebecca Lindland, an auto industry analyst with Kelley Blue Book. Lindland says she was shocked and saddened over the weekend when news came out that Marchionne had suddenly become too ill to continue leading Fiat Chrysler. "It has developed from a manufacturing base with four plants in one country to a global automaker with 10 plants in six countries," Manley said of Jeep during the Los Angeles Auto Show last year. Sales of Jeep vehicles in that time have quadrupled. That's a big reason why Manley was chosen to lead Fiat Chrysler, also known as FCA, into the future. But that future still comes with huge challenges. One, according to Lindland, is China. "China is the world's largest new-car market," she says. "And FCA really doesn't really have the type of presence that it should have in that country." Another looming challenge: tariffs. They have already led to higher prices for aluminum and steel, which may cut into profits for all carmakers. And the Trump administration is looking at whether to put tariffs on vehicles, including those imported from Europe. That would have a direct impact on Fiat Chrysler, according to Jeff Schuster, an analyst with LMC Automotive. "The vehicle that's impacted the most in all this, interestingly, is the Jeep Renegade, which is coming from Italy," he says. He says Fiat Chrysler imports about 100,000 Renegades annually from Italy to the U.S. That's more than any other single model from Europe. Automakers, and their suppliers, have united to push back against possible tariffs. Marchionne had been one of the most prominent voices speaking out. Now that job, along with a whole lot of others, falls to the new guy, Mike Manley.